Win A Train Getaway For Two To Chicago By Helping To Restore The Caboose! Donate to Enter To Win! Want To Win An Amazing Getaway to Chicago for Two? The Plymouth Historical Museum needs our help to raise $20,000 to move and restore the caboose and are shy of their goal so Dwellings by Rudy & Hall has teamed up with Kelly Brown of Guaranteed Rate to help them reach it. In the past for the Plymouth Ice Festival Dwellings by Rudy & Hall and Kelly Brown of Guaranteed Rate have teamed up to do some amazing giveaways. Everything from a family pass to the Henry Ford Museum to a Cruise for 2 to the Bahamas. This year, we wanted to give back to the city that has given us so much. A past client reached out to us asking us to donate to this amazing project and we thought this would be the perfect opportunity! So from now until Monday 1/14/19 everyone that donates to help "Save The Caboose" will be entered to win a weekend trip for two to Chicago courtesy of Dwellings by Rudy & Hall and Kelly Brown of Guaranteed Rate. The winner will receive a three-day getaway for two to Chicago. Jump aboard an Amtrak train leaving out of Dearborn and be whisked away to the Windy City. Once there, enjoy a two night stay at the historic Palmer House Hilton hotel. After you check in discover all the “Windy City” has to offer. Take a stroll down the Magnificent Mile, which features world-class shopping. Listen to some of the best music on the planet at one of Chicago’s amazing blues clubs. Explore Millennium Park. Spend some quality time at Navy Pier. Your getaway also includes a Big Bus Tours Chicago Deluxe The Big Loop Hop on Hop off 48 Hour Pass as well as a Chicago CityPASS®, which gives you access to some of the most popular attractions, such as the Shedd Aquarium, the Field Museum, and the Skydeck. There is so much to do and see here, and this three-day getaway is the perfect way to experience this fabulous city! After an amazing weekend in the Windy City, board the train for a relaxing journey back to Dearborn on the rails. Everything included, this trip is almost a $1000 value! Simple click on one of the links on this page and make a donation the Plymouth Historical Museum to help "Save The Caboose!" It's that simple. Make a donation and be entered to win. Everyone that donates between 12/11/19 and 11:59pm 1/14/19 will receive one entry. A winner will be drawn on 1/18/19. Winner will be contacted and announced on the Dwellings By Rudy & Hall Facebook Page. 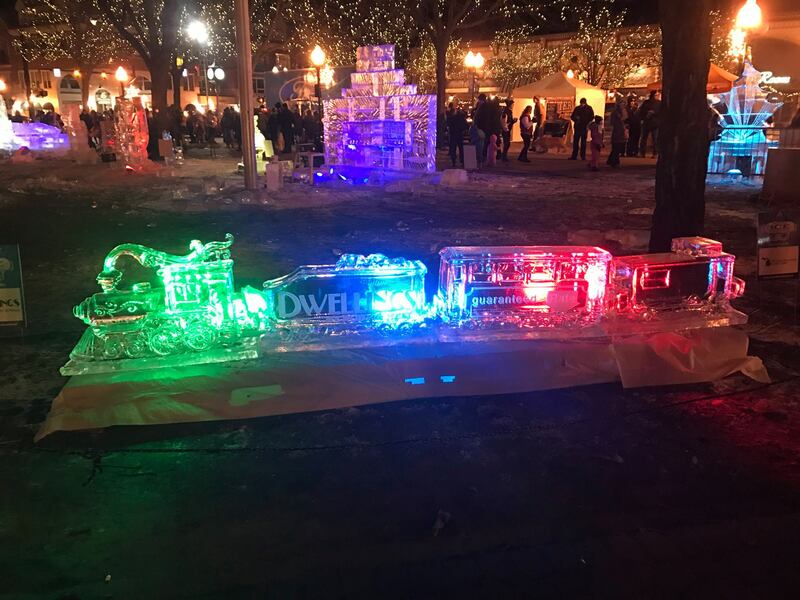 Make Sure To Check Out The Caboose Ice Sculpture! This year at the 2019 Plymouth Ice Festival Dwellings by Rudy & Hall and Kelly Brown of Guaranteed Rate are going to have the caboose recreated in ice! Come on down and see this amazing creation in person! Donate Now To Be Entered To Win!